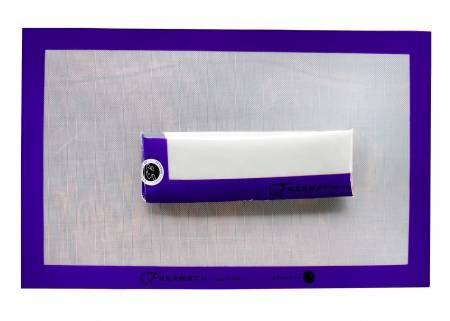 Quilting Notions > Fusamat 12" x 18"
The Fusamat is designed to be slightly tacky so that your pieces stay in place without slipping and your mat does not move on your ironing surface. It means you can break your applique into smaller units that are easier to manage because you now have very good accuracy of placement since the mat is transparent. Because there is no migration of the fusible it stays put on the fabric and does not exhaust the fusible so can be heated again and again you can heat the Fusamat up to 536 degrees Fahrenheit with no distortion of the mat – making it very safe to use.